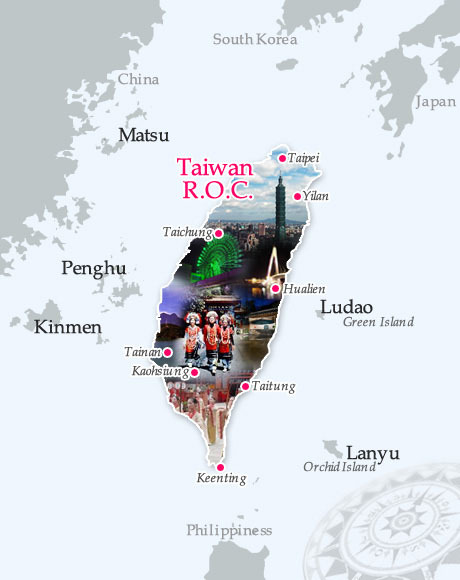 Taiwan is situated in the Pacific Ocean about 160 kilometers (100 miles) from the southeastern coast of the Chinese mainland. Located about midway between Korea and Japan to the north and Hong Kong and the Philippines to the south. Taiwan is a natural gateway for travelers to and within Asia. Shaped roughly like a tobacco leaf, Taiwan is 394 kilometers (245 miles) long and 144 kilometers (89.5 miles) wide at its broadest point. The Central Mountain Range bisects Taiwan from north to south and about two-thirds of the island is covered with forested peaks. The rest of the island is made up of foothills, Terraced flatlands, and coastal plains and basins. Taiwan province includes the Penghu Archipelago – a group of 64 islands previously known as the Pescadores – and 21 other islands. Taiwan’s climate is subtropical, with average annual temperatures of 22°C (72°F) in the north and 24°C (75°F)in the South. Summers, which last from May through September, are usually hot and humid with average daytime highs from 27°to 35°C(81°to 95°F). Winters, from Dember through February, are short and mild, with average lows from 12°to 16°C(54°to 61°F); snow falls only on the higher mountains. Taiwan’s population exceeds 22 million, which makes the island one of the world’s most densely populated places. Except for the approximately 325,000 aborigines, the people of Taiwan originate from the Chinese mainland. The national language is Mandarin Chinese, though other dialects are also spoken. Many people can speak some English (the most widely studies foreign language), but taxi drivers generally speak only Chinese. In Taiwan, electricity is 110 volts, 60 cycles throughout the island. International hotels usually have 240 volt outlets for shavers. Most shops, department stores open from 10am till 10pm, seven days a week. Offices open from 8:30 am (or 9am) till 5:30 pm with a mid-day break 12:00-13:30 (mostly), Monday through Friday. Closes on Saturdays, Sundays and national holidays.